I’ve got to be honest, I might not have even tried with sweater on were it not for my friend Meg. I was on my own in the store when I saw this and I immediately heard her voice in my head, telling me it was amazing and that I needed to have it. It is very likely that she was correct. This sweater is amazing, though far louder than the things I typically wear. I am hard pressed to reject anything leopard print though. It’s actually more like a sweatshirt than a sweater, which makes it even better in my book. 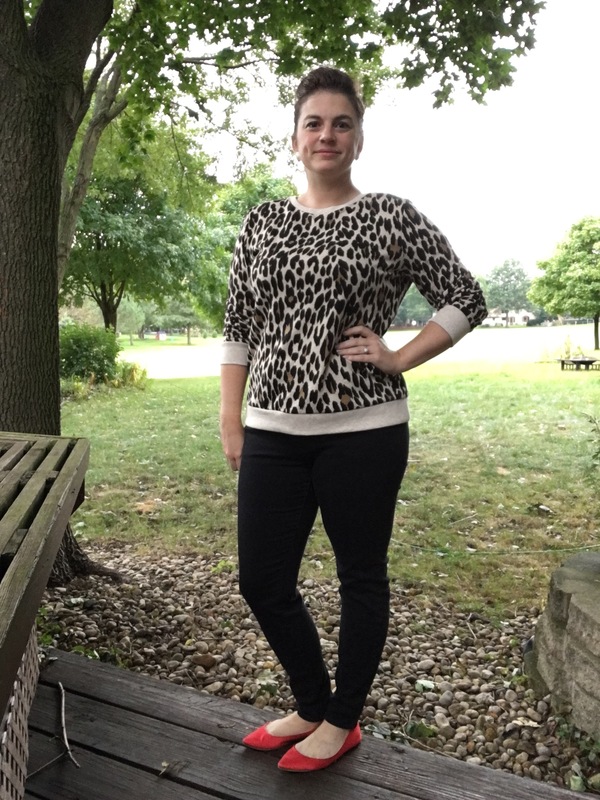 I kept my look pretty casual but still work appropriate with black skinny jeans, red flats and some chunky earrings, but you could absolutely dress this up more with black leather leggings, heels, a glam statement necklace, and a great oversized clutch. You could also go the other way and make it even more weekend-appropriate with ankle crop skinny jeans and black or brown flats. Gotta love something that fun and versatile. I do understand that if you work in a more conservative or business-dress environment that this probably won’t be good for work, in which case you can keep it in reserve for a fun weekend look doing errands, brunch, and maybe some bookstore browsing (one of my favorite pastimes). What do you think? Would you wear this much leopard?